Prince Harry's wife looked elegant in a cream bespoke Givenchy dress as she rode the Royal Train to Runcorn station in Cheshire. 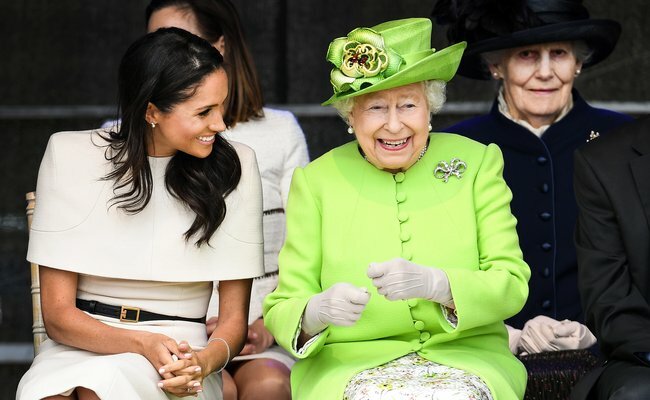 The Duchess of Sussex accompanied The Queen on her first solo outing to Cheshire, where the two were all smiles as they greeted the crowds. Dressed in a bespoke Givenchy dress, Meghan looked every inch the perfect Royal as she teamed the cream gown with a black belt, clutch bag and court shoes. Whilst her elegant frock is a unique item, you can still get the look thanks to these high street alternatives. This elegant lace alternative is currently in the sale, and oozes style and sophistication. Another sale bargain, this chic alternative to Meghan's Givenchy number is perfect for any formal occasion. This flattering bodycon dress can be dressed up or down for any summer occasion. This unique neckline gives a glamorous edge to the typical laced frock, and looks all the more cute for it! Expose the shoulders in this stylish frock. This unusual peach shade would compliment a nice sun tan! This smart gown incorporates the pencil-style favoured by Meghan, and the frills give a nice twist to a classic look. Meghan, who has only part of the monarchy for a month, has been following in Duchess Kate's footsteps and is proving the ultimate Royal fashionista!